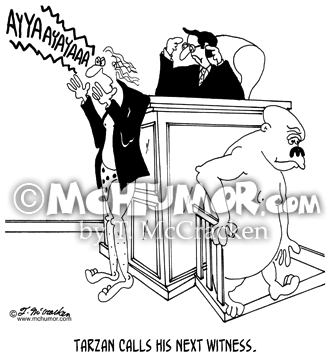 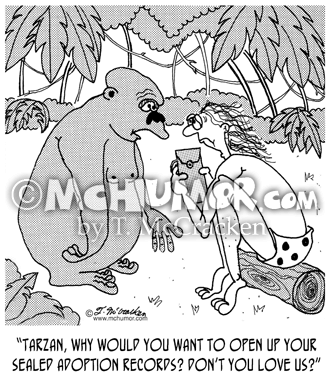 Adoption Cartoon 4896: A gorilla asking Tarzan who's holding a file, "Why would you want to open up your sealed adoption records? 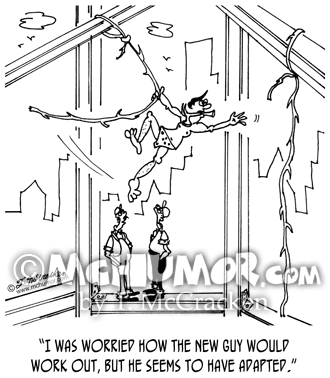 Don't you love us?" 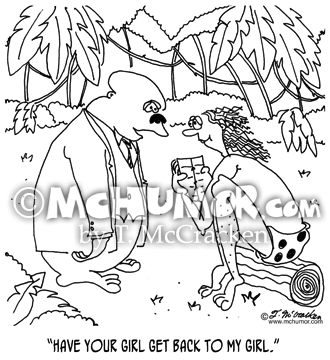 Tarzan Cartoon 5939: An ape in a business suit says to Tarzan, "Have your girl get back to my girl." 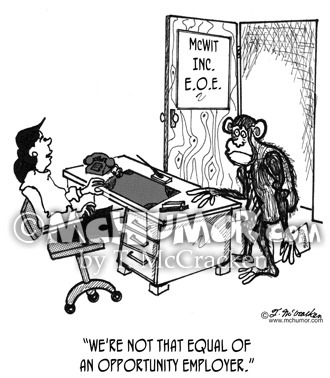 Monkey Cartoon 1839: A woman in employment office saying to a monkey, "We're not THAT equal of an opportunity employer." 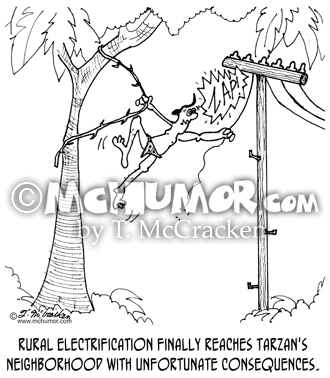 Tarzan Cartoon 3921: "Rural electrification finally reaches Tarzan's neighborhood with unfortunate consequences." 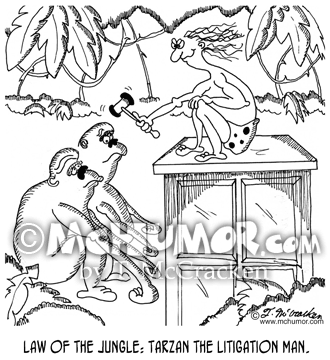 Tarzan swings from one electric line. 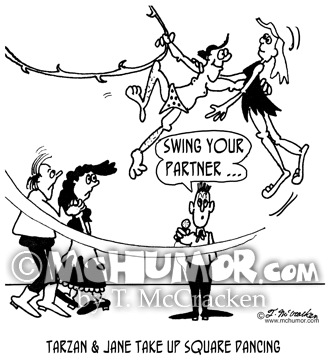 Tarzan Cartoon 4001: "Tarzan & Jane Take Up Square Dancing." 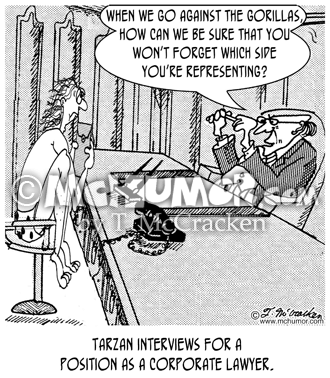 A dance caller says, "Swing your partner" and Tarzan swoops down on a vine and picks up Jane. 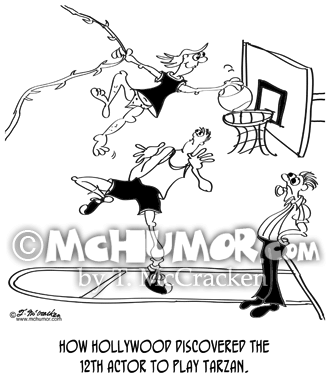 *Denny Miller, the 12th actor to play Tarzan was discovered at a UCLA basketball game. 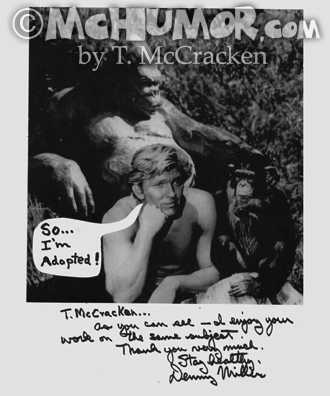 Denny Miller Cartoon 9048: Denny Miller, the 12th actor to play Tarzan, sent me this photo inspired by one of my cartoons.